Less than week after NASA's flyby of Comet Hartley 2 and scientific discoveries are already being announced, including the latest finding that dry ice is the fuel for the comet's jets seen bursting from its surface. 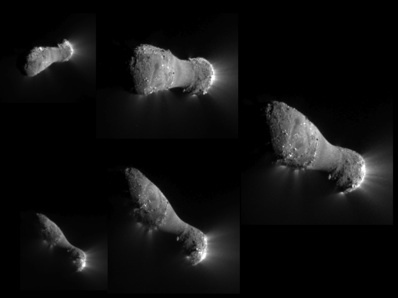 This image montage shows comet Hartley 2 as NASA's EPOXI mission approached and flew under the comet on 4 November. The images progress in time clockwise, starting at the top left. The Sun is to the right. Image: NASA/JPL-Caltech/UMD. During the flyby, which saw the recycled Deep Impact spacecraft pass within 700 kilometres of Hartley's 2 by 0.4 kilometre nucleus, spectacular jets were seen erupting from many spots on the surface. Spectral analysis finds that the primary constituent of these jets is carbon dioxide gas, accompanied by particles of dust and ice. Smaller amounts of organic materials are also present. 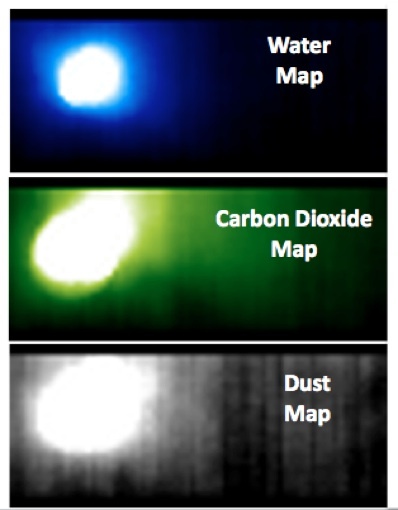 Distribution maps of water, carbon dioxide, and dust around 103P/Hartley. Image: NASA/JPL-Caltech/UMD. Although the presence of carbon dioxide is no surprise, the volume of gas escaping from the comet was much more than expected. Previously, the Deep Impact spacecraft had visited Comet Tempel 1, and only five comets in total have been toured by spacecraft. With data from the EXPOXI mission being returned at a rate of some 2,000 images a day, the project team say they will have many more science findings to report in the coming weeks.